CBC Sports commentator Don Cherry's Game 7 sports jacket sent hockey watchers to their keyboards in the first intermission Wednesday night. 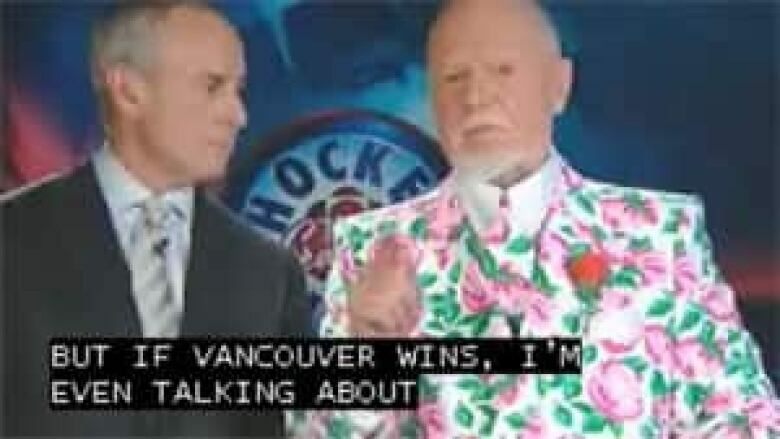 Hockey Night in Canada commentator Don Cherry's Game 7 sports jacket sent hockey watchers to their keyboards in the first intermission Wednesday night. The social media site Twitter lit up with bemused, amused and downright nasty comments aimed at the coat, which featured pink roses with bright green leaves on a white background. Cherry's tie matched, as it often does for his appearances on the popular "Coach's Corner" segment. "When 'Coach's Corner' ends, Don Cherry's suit will be escorted to a cell at The Hague," commented Maclean's columnist Scott Feschuk. Comic Carla Collins piped in: "Just saw Don Cherry's jacket for Game 7. Somewhere a couch in Woodbridge is missing its slip covers." A Twitter user going by the label of OT_Group? added: "Is Cherry's jacket 'garden centre camo'?" "Have Don Cherry and Elton John ever met? Because they should meet. And swap jackets." "Don Cherry's jacket is screaming, '"I know what happened to the ladies room BarcaLounger from Studio 54!'" "He needs a big pink hat with a feather." Cherry has occasionally worn other rose-strewn coats in the past in honour of his beloved wife Rose, who passed away in 1997. He almost always wears a rose in his lapel as a tribute to her as well.